I often get asked when someone should file to change parenting time. Unlike last week, where we discussed how hard it is to change custody, in Oregon it is actually very easy to change parenting time. 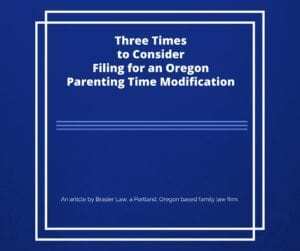 When discussing Oregon parenting time modifications it is important to distinguish the difference between this and changes to custody as people often use the two interchangeably outside of the family law world. The difference is, that unlike making a change custody (essentially meaning you are changing the primary parent), a change to parenting time doesn’t require any big showing of neglect or major problem. All you have to do, to change parenting time, is convince a judge that your new parenting plan is in the child’s best interests.Usually people only file to change parenting time when they have a good reason to, but this system can sometimes be abused by parents who just don’t like the judge’s first ruling. 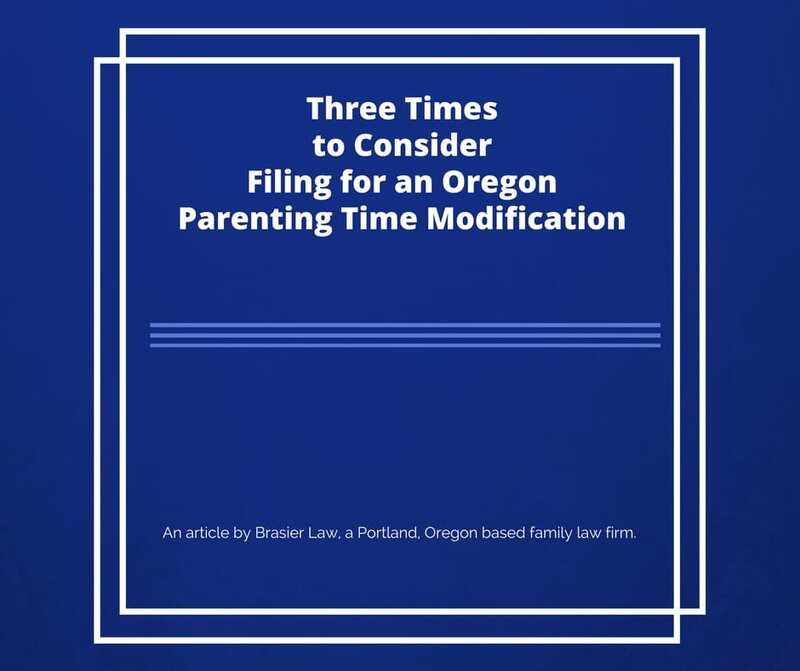 We will go over some times that it really does make sense to file for a parenting time modification, but as always we recommend checking with an experienced Oregon family lawyer about the particulars of your case. 1. If circumstances change so that a change to the parenting plan would make sense. For instance, let’s say your first parenting plan starts when the child is 3 and not in school. Well, when your child turns 5 or so and starts kindergarten, you may need a new plan which takes this life change into account. 2. If your Oregon parenting plan hasn’t been followed for a long time, you should change it. Sometimes people will get a court order that lays out a parenting plan, but then they proceed to just do their own thing by agreement for a number of years. For instance, if your plan says dad has the children every other weekend, but you two just decide after the fact to do a 50/50 split for a couple of years, but don’t file this change with the court. Well, the problem is there is still a written court order that says dad only gets every other weekend, dad really will want to get a new court order in place matching the real schedule. Otherwise, mom could get mad at him and force the old order to be followed on a whim. 3. If you really feel the current parenting plan is not good for the child. With this one, you need to be careful. A lot of people who go through court and lose, don’t like their court order. They then become what I call “serial litigators” where every year or so they drag everyone back into court and ask for the parenting plan to be changed. You usually don’t want to file a parenting modification unless something has changed, like a lot of time has passed, or some major life event has happened. The reason is it is a big expense and a big stressor to everyone to have to go to court, and judges don’t take kindly to their time being wasted. They can always punish the person for trying this by ordering parenting time to be reduced or attorney fees to be paid, so be careful not to abuse the system. It is always a good idea to make sure the reasons for seeking a Oregon parenting plan modifications are centered around what is best for the child(ren) involved, but there are times when practical things like beginning school are a big factor for change. We have covered a few situations where it may be a good time to file for a parenting plan modification, but every case is different and it is always a good idea to have a custody lawyer go over the facts of your case before making a finial decision. We hope this gave you an idea about the difference between custody and parenting time and when a change might be sought. Tom Brasier is an experienced custody and divorce attorney practicing in the greater Portland, Oregon and SW Washington areas. Tom can be reached at Brasier Law a Portland based family law firm, by calling 1 (503) 855-4777 or by using the contact form below.